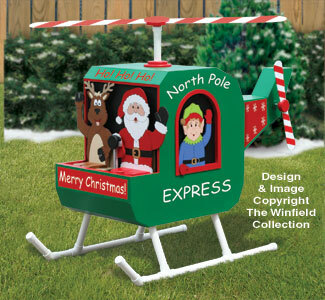 Santa is running late this year so he's making some express deliveries with his North Pole Helicopter! Our latest motorized Christmas display will be a big hit with kids and adults alike---the main rotor blade turns slowly overhead as the tail rotor blade spins, Frosty looks out the far side window and the three North Pole characters happily wave to onlookers! Make this colorful animated display from standard lumber, plywood, PVC pipe, electrical conduit, hardware and our Specialty Parts Kit. 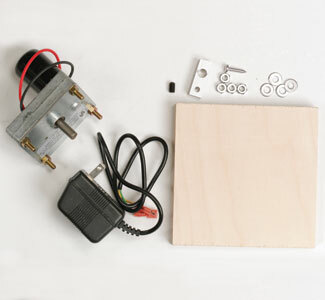 Add the motion to the entire project with just one Motor Kit (both kits available separately below). Includes one hard-working 12 volt DC, 12 rpm synchronous gear motor with 40 in lb torque, AC/DC adapter, four motor mounting nuts and washers, one aluminum connecting link with set screw, nuts, washers and specialty plywood for drive gear. 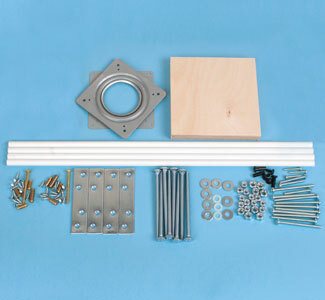 Includes carriage bolts with washers and nuts, machine screws with locking nuts, lazy susan, special gear plywood, steel straps with screws, brass sleeves with screws.